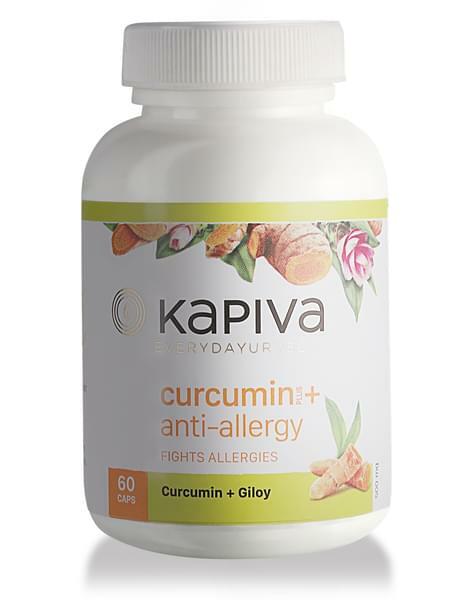 Kapiva’s Curcumin and Giloy Capsule offers protection against numerous allergies, helping the consumer stay healthy. The capsule is made up of two main ingredients - curcumin and giloy. Curcumin is a natural anti-inflammatory compound. Giloy is known as “Amrit” in ayurveda because of its tremendous medical benefits. Both of these ingredients are precisely mixed in this capsule that will help in fighting against various allergies. Benefits of curcumin: • It has powerful anti-inflammatory effects and is a very strong antioxidant. • Helps neutralize the free radicals from body and circulates the antioxidant enzymes to provide health benefits. • It is anti-inflammatory and contains a lot of anti-cancer qualities. Benefits of giloy: • Also known as the powerhouse of antioxidant which helps in fighting against free-radicals and keeps your every cell healthy. • Works as an anti-inflammatory agent and solves problems like cough, cold, tonsils, etc. • Protects against multiple allergies.